Check your hearing protection device’s noise reduction rating to ensure you are receiving ample protection. If you’re in an occupation that’s exposed to frequent loud noises, it’s important to use properly rated earplugs in order to prevent hearing loss. Noise Reduction Rating (NRR) measures the effectiveness of hearing protection devices. The higher the NRR on a hearing protector, the better it will be at reducing noise. 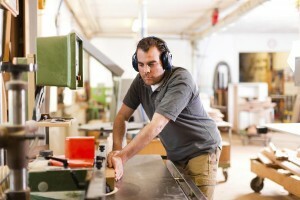 Hearing protection reduces the level of exposure to noise based on the noise reduction rating of the protection device. It’s worth noting that NRR is measured in decibels, but the hearing protector you used does not reduce the surrounding decibel level by the exact amount of decibels ascribed to the protector’s NRR. To actually determine the amount of decibel reduction provided, you take the NRR number (in decibels), subtract by seven and then divide by two. For example, if your earplugs are rated for 33 dB NRR, they would reduce noise exposure by 13 dB (33 – 7)/2 = 13. 150 dB = Rock concerts at their loudest point. 140 dB = Firearms, air-raid siren, jet engine. 120 dB = Jet plane take-off, amplified music, car stereo, band practice. 110 dB = Heavy machinery, model airplanes. 100 dB = Snowmobile, chain saw, pneumatic drill. 90 dB = Lawnmower, shop tools, truck traffic, subway. 80 dB = Alarm clock, busy street. 70 dB = Vacuum cleaner. 60 dB = Regular conversation, dishwasher. 50 dB = Moderate rainfall. 40 dB = Quiet room. 30 dB = Whisper, quiet library. This entry was posted on Friday, September 16th, 2016 at 11:26 am. Both comments and pings are currently closed.